This year I became an accidental author. Not that I didn’t want to write a novel, I always thought I would one day, but it wasn’t on my to-do list anytime soon. My previous writing career had encompassed scriptwriting for everything connected to cinema and TV, from soap opera to drama, short film to feature film. All of these visual formats have one thing in common: the written word is not their end point, just a part of the journey. The dialogue on the page will eventually be heard, the descriptions seen. A screenplay is a blueprint for the director, actors and crew. It’s the beginning. Some TV writers would disagree, but I am a director too, and know how much input goes into a production, from many creative hands, once the script is finished. And when the shoot is wrapped, most of the people involved will bin their paper scripts – now dog-eared and covered with scribbled notes. Only a handful might keep one, for sentimental reasons, and bin it later. Two years ago, I completed a draft of a feature film script set in the Italian colony of Eritrea in the 1930s. Back then it was called Objects of Interest, for no great reason. My publisher would later suggest The Good Italian. It’s an intimate but also epic love story set against the backdrop of major social upheaval and war. A two-hander with a cast of thousands. My producer and I pitched it at the festival markets at Cannes and Berlin, where we got an enthusiastic reaction – and no takers. We even got a Special Jury Mention at the Rome Film Festival for the project’s “modern and incisive vision of Italy’s colonial past”. We celebrated that one, but we were still no closer to a green light. Most of our pitch listeners said the same thing: “It’s too big for us.” Some also asked “What novel is it based on?” Inspired by the latter, my film agent sent the script to a literary agent, who read it and asked if I would like to have a go at writing the novel. And that’s how it happened. I tripped my way into becoming an author. Unfortunately, there was still a lot to learn, the hard way, by making mistakes. Novels and scripts have similarities and differences. Ideally, both will have strong, well-rounded characters, an engaging story, and a good structure. Novels are longer obviously, at least four times the length of an average film script by word count. There’s more room to breathe in a novel, to go off on tangents, to explore the depths of the lead protagonists and to expand on the minor ones. It can be a thousand pages, or one hundred. With a feature film script, whatever the organic length of the story, it’s a given that it should come to an end somewhere around ninety to one hundred pages. This has become an industry standard for a variety of reasons. The cost of producing a film goes up, the more pages that have to be shot. Audiences are reluctant to sit through anything longer. And for profit reasons, cinema owners want to be able to schedule three or four shows a day. So inevitably, with screen time being precious, some of the writer’s darlings will be eliminated along the way. One of my greatest pleasures during the process of writing The Good Italian novel was being able to give life back to a much-loved character that I had deleted from the script. She now exists forever; I hope deservedly so. Her name is Maria, the lead character Enzo’s sister. In a screenplay, you cannot write what a character is thinking. You can only write what will be seen, so unless their thoughts are likely to be betrayed by a facial expression, then you can’t for instance write that Joe is thinking about the way Doreen’s hair caught the sunlight yesterday. It would take a truly fine actor to get that across with a look. In a novel, you can of course write Joe’s thoughts, if you want. You can write pages and pages of what is going on in his head. In the beginning, being able to do this was a liberating experience for me. The inner mind of my characters was now unchained. However, I’ve learnt, sadly, that this wonderful gift to novelists should be used in moderation. As with film, show-don’t-tell is a guiding principle to live by. This came as a surprise to me, but in this respect readers are like movie audiences, they don’t need, or want, everything spelled out for them. They will fill in any blanks. They are not stupid. And they don’t like it when you treat them as if they are. Point of view in cinema and novels are related but quite different. In film, you can include a shot from any character’s point of view. This is frowned upon in literary circles, even though some of the most successful writers do it all the time. Head-hopping, a new phrase to me, is when the writer jumps from inside the mind of one character to another, even between multiple characters within the same scene. My experienced guides through this new minefield encouraged me, gently, to at least begin my novel-writing career by doing the right thing. So I learnt to rein in my wandering POVs. My lead character Enzo, an Italian civil servant, is a stickler for rules and regulations, and he would definitely have approved. I still consider it sound advice. It’s harder, for sure. It takes discipline, and forward planning, but I think my novel is the better for it. It has also made me rethink how I approach point of view in my scripts. In a screenplay, there is usually very little description, a bare minimum of prose, just enough for the reader to get the picture and move on. Because it is all about pictures. This, I think, is the biggest challenge for a scriptwriter moving into novel-writing. Words are all you’ve got. The cinematographer will not work some magic with light and shadow. The fabulous actors will not say it all with their eyes. And you can’t fade up violins and cello for emotional impact either. As I embarked on the first draft of the novel, I overcompensated for this loss by describing absolutely everything in the minutest detail. Finding the right descriptive balance became a process of trial and error. And where this didn’t work, my editor wisely suggested cuts with that red line button of hers. Which brings me to another similarity between films and novels. Despite the familiar image of the lone writer in an attic tapping away on a typewriter, both films and novels are collaborative media. This may come as a surprise to some, but authors, in my brief experience and from talking to others, are treated with more respect than scriptwriters. A novel is seen, rightly, as the author’s own work, and what he or she wants it to be is considered important. A script, on the other hand, is treated as a moveable feast by all who come into contact with it, from financiers and producers to the actors who will interpret the roles. If you have ever seen a Hollywood film credit roll with an unusually long list of scriptwriters, it’s because half of them were fired along the way, and only sections of their hard work survived as far as the final cut. For a writer, stepping from that world into the literary world is a joy. I must confess that before I wrote this novel, I was someone who would not bother reading a book if the film version was on the way. For shame, I hear you say. Indeed. I agree. But it’s encouraging to see that a byproduct of a film is often a resurgence of interest in the novel it was based on. Look at The Life of Pi, filmed over a decade after the novel was published, propelling it back up the book charts. And Twelve Years a Slave, adapted nearly two centuries later, and encouraging a new readership to seek it out. I thoroughly enjoyed The Life of Pi movie, but I’m so glad I read the novel first. As for The Good Italian, it will hopefully be a film one day, but that’s for the future. Right now, I’m delighted to have written the novel, it’s been a great experience, one that I intend to repeat very soon. Stephen Burke was born and raised in Dublin and studied film at the Dublin Institute of Technology. 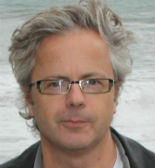 He began his writing and directing career making multi-award-winning short films about the conflict in Northern Ireland. His first feature film was Happy Ever Afters starring Sally Hawkins. His directing work for television includes Anner House, based on a story by Maeve Binchy, and the award-winning state-of-the-nation series No Tears, which won Best Drama Series at the Monte Carlo TV festival. 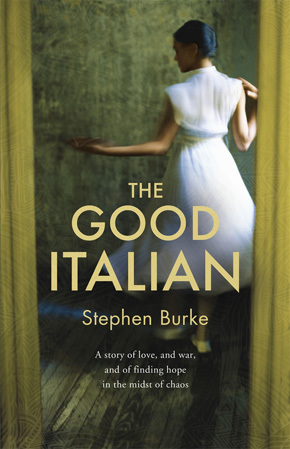 The Good Italian is published by Hodder & Stoughton in hardback and eBook. Read more.